Louisiana summer feasts were never complete without a sweet, refreshing slice of candy orange cantaloupe. I recall my mother teaching me how to pick out the perfectly ripe, saccharine cantaloupe for dinner at our local grocery store in Lake Charles, Market Basket. I crawled out from under the basket, which was the perfect spot for a five year old to gobble down any and all treats picked from the grocery store shelves in peace and quiet. I stood on the edge of the cart and reached over into the cantaloupe bin. The treasures in my overalls started to peak its way out of my pockets and onto the red and black checkered floors. I glanced at my mom for a little help, and she held me by the side so I could have an adult-eye-view of the cantaloupe. My mom explained how I needed to look for a melon with little to no markings, bruises or scars due to battle in the bin no less. Then my mother told me to knock on the melon with my little fist. I didn’t quite understand the importance of this action, but I took the advantage of thumping the cantaloupe twice while saying, “Knock, knock, is anybody home?” The next step was by far the most important and the most wonderful. I took the melon (which just so happened to be the size of my head) and slowly cradled it next to my button nose, closed my eyes and took a deep breath. The smell of sugar and earth filled my nostrils and without hesitation I looked up at my mom and said, “This one is ready!” And there I sat, underneath the cart with my melon in one hand and the other hand resting under my head, thinking and dreaming of dinner and the sweet taste of the perfectly ripe cantaloupe. Note: Cantaloupe, like all melon, has a lot of moisture. So if you leave the cantaloupe sitting around after a few minutes or so, the crunchy, sugary topping will become more like a burnt sugar glaze over the melon. Also, if you don’t have a torch handy in the kitchen, you can quickly grill the honey-glazed melon in a piping hot skillet for just a few seconds. Growing up, we always ate cantaloupe by the humble half-moon slices at the table. So, I wanted to come up with a recipe that closely resembled the pure form of the melon. 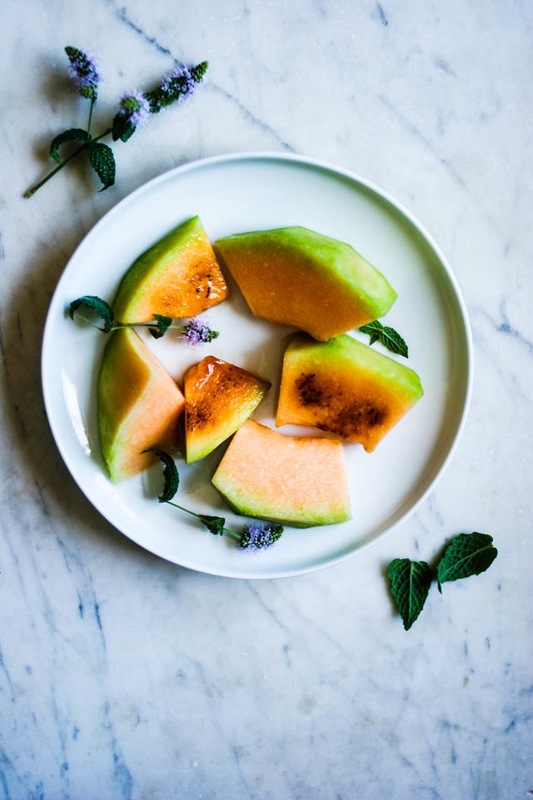 Slightly caramelizing cantaloupe using honey enhances the sweetness of the melon while also creating a lovely smoky flavor that is unexpected yet satisfying. Just peel, seed and cut up 1 ripe cantaloupe into 2-3 inch cubes. Place the cubes onto a paper towel for 30 minutes. Basically, you are creating a drier surface to caramelize. Flip the pieces of melon over drizzle local honey onto the dried side. Using a kitchen torch, caramelize the honey until charred and almost blackened all over. Let the honey set for just a moment before taking a bite of the cantaloupe. Serve immediately as a side, snack or as a lovely addition to a fruit and cheese plate. Hi Amber… I just wanted to take a moment to tell you what a strong affinity I feel for your work & how much it excites me to see a fellow southerner diving deep into our culinary heritage with such grace, creativity, and beauty. Your work is just wonderful & inspiring, and I love your stories. I get kind of giddy about there being someone else out there who’s so likeminded culinary-wise. I’d love to share a glass of tea over some pimento cheese and spicy fried peanuts one day! I feel the same about your work as well! You always seem to surprise and inspire me with your culinary creativity. Thank you so much for the kind words. I would love to sit on the porch for a visit while drinking sweet tea with you!